´On the back of celebrating his old Pele songs with two 25th Anniversary Tours, Ian Prowse releases a brand new full band album which includes ex -Pele members in Spring 2019. 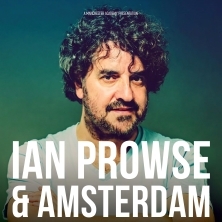 Ian Prowse & Amsterdam (7 piece) will also be doing just five or so UK dates in May / June playing all the favourite Pele & Amsterdam classics along with the belting new songs. Page generated in 0,210430 seconds.